(Nanowerk News) Researchers have demonstrated here a transfer printing method based on a hydrophobic mold suitable for high-resolution patterning of graphene inks. As the team reports in ACS Nano ("High-Resolution Transfer Printing of Graphene Lines for Fully Printed, Flexible Electronics"), the robust thermal stability of the mold (∼250°C) allows broad process compatibility, enabling printing of conductive, flexible, sub-5 µm graphene patterns. Over the past few years, high-resolution printing of electronically functional inks on plastic or paper substrates is a compelling manufacturing platform for large-area, low-cost, flexible electronic systems with applications in sensors, displays, energy devices, smart packaging, and radio frequency identification. The demonstrated printing resolution for pristine graphene inks has to-date been limited to 30 µm, primarily due to lateral spreading of the functional inks which results in low aspect ratio features with suboptimal conductance. The development of high-performance flexible electronic devices however requires a reliable route to printed graphene patterns with line width and spacing of just a few microns. In addition, line edge roughness decreases print consistency and yield for high-resolution, closely spaced features such as transistor electrodes. In their present work, the researchers demonstrated excellent conductivity and flexibility of the graphene electrodes and utilized them for fully printed electrolyte-gated transistors tolerant to tensile strains of 1% over 1000 bending cycles. 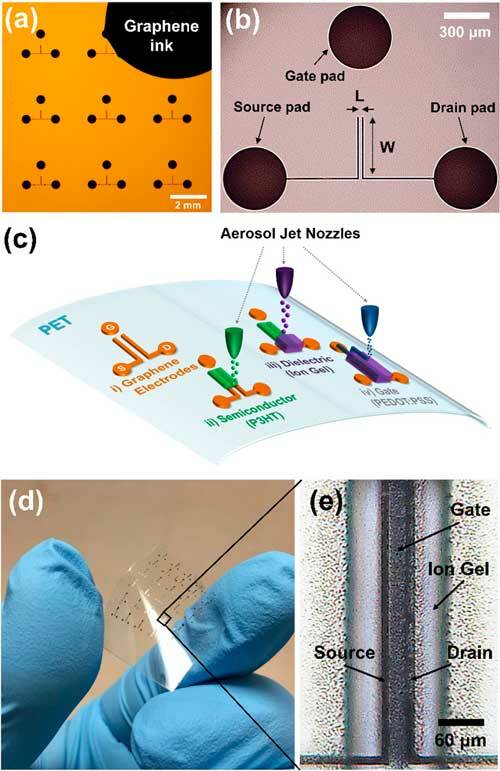 By leveraging the high-fidelity printing process, capable of achieving line edge roughness below 25 nm, the transistor channel length could be scaled to ∼1 µm, offering a compelling advantage for progress in the scalable fabrication of nanoelectronic devices. "This promising platform for transfer printing offers significant potential for expanding the design space to integrate functional inks with precise, high-resolution patterning methods, ultimately advancing the development of high-performance, flexible, printed electronic systems," the authors cocnlude their work.